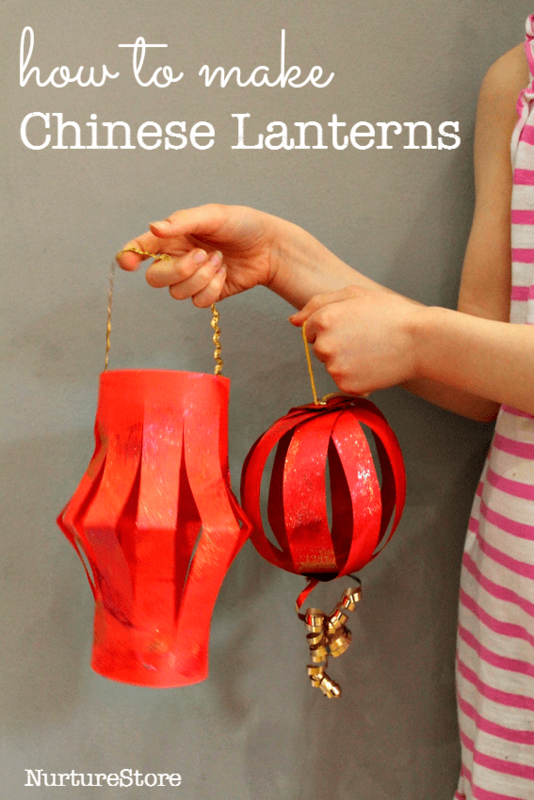 Two pretty ways to make easy Chinese lanterns: they’re great Chinese New Year crafts for kids and a fun way to work on scissor skills. 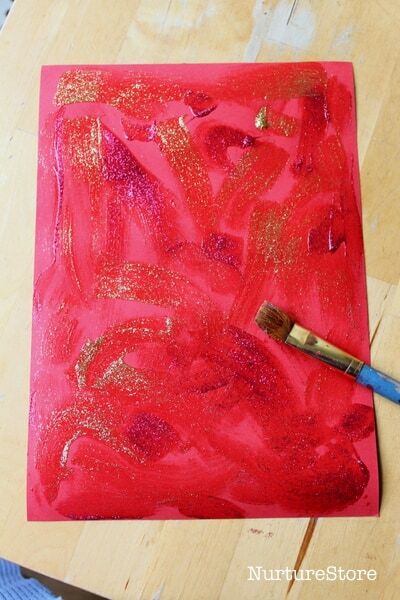 Did you see the red and gold Chinese sensory paintings we made? We used some of them to make our lanterns. 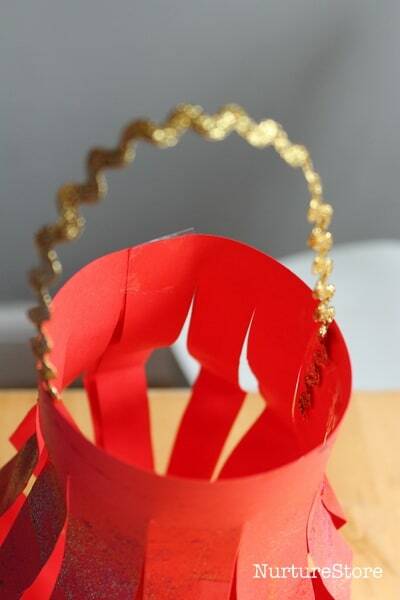 For the first Chinese lantern design, you need to fold your piece of card in half, lenghtways. 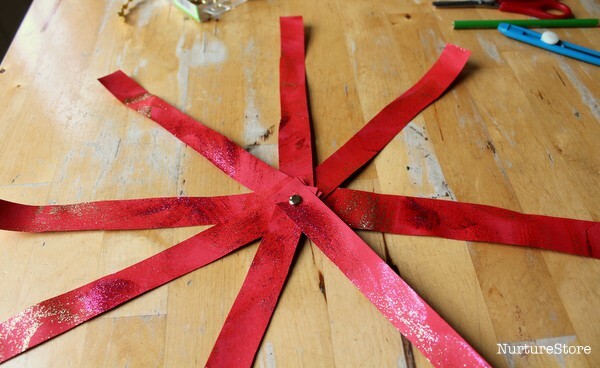 Use a pair of scissors to cut lines along the fold, as shown in the photograph. It’s important to not cut all the way across, as if you do your lantern will fall into pieces. You could drawn lines on the card for your child to follow, or they can cut just by using their eyes to guide them. It’s not essential to cut in perfectly straight lines, or to space them out exactly, so encourage your child to have a go with the scissors. 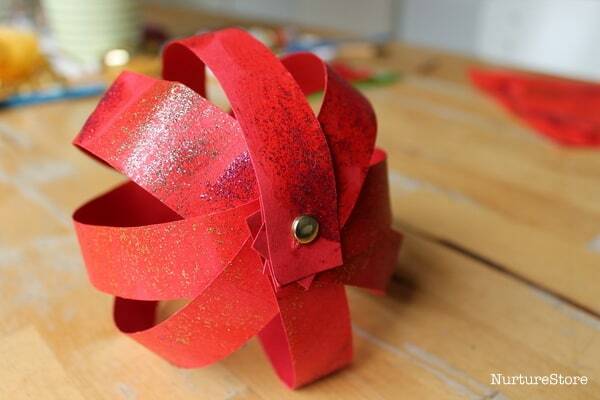 Then you need to open out your card, and roll your lantern up so that the two shorter sides meet. We fixed ours with sticky tape, but a stapler is good too. Add a handle on the top so you can hang up your lantern. We used some gold ric rac, held in place with tape. 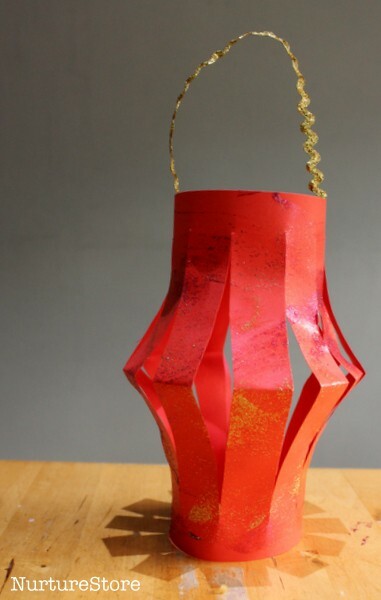 The finished lanterns have a great shape and can be strung across the room in chains. For the second style of Chinese lanterns, inspired by the pumpkin craft we made for Halloween, we cut one of our pieces of card into 8 strips. Again, we don’t need perfection, so encourage your child to use the scissors, giving them drawn lines to cut along if they would like them. Then, use a split pin to fix all the strips together at one end. Splay out the strips as shown in the photograph above. To complete the lantern shape, curl each strip round to create a ball and fix all the loose ends together with a second split pin. We added some gold ribbon underneath as an extra decoration, and used some gold yarn on the top as a handle. With both lanterns, the more the merrier! 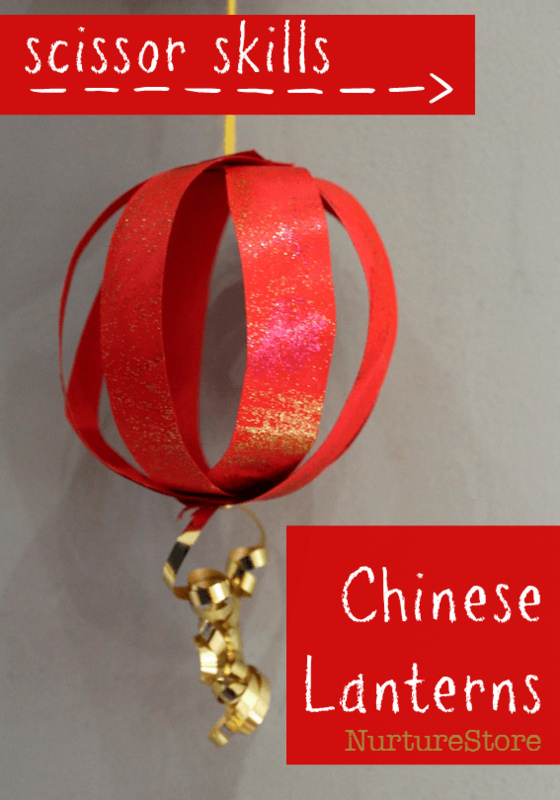 Have the whole family or class join in making them and you can festoon your ceilings with strings of them for a pretty Chinese New Year decoration. Raise a global child! Exploring festivals from different countries and cultures is a wonderful way to learn about the world. 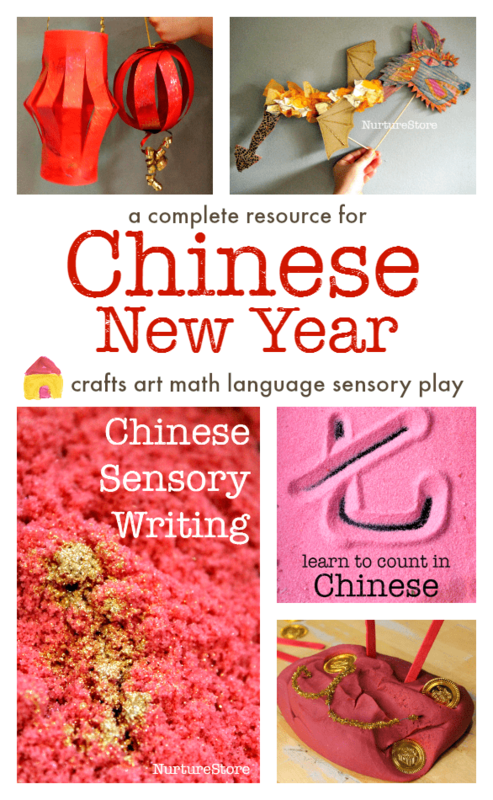 You can see our archive of Chinese New Year activities here. 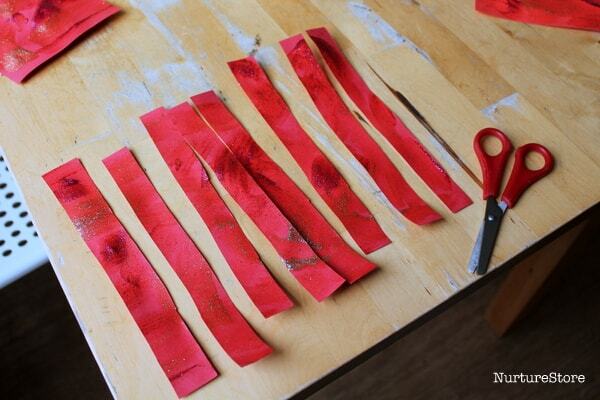 Very easy thank you I intend making some with my nieces for our Chinese theme Xmas. Thanks Christi. Happy new year! 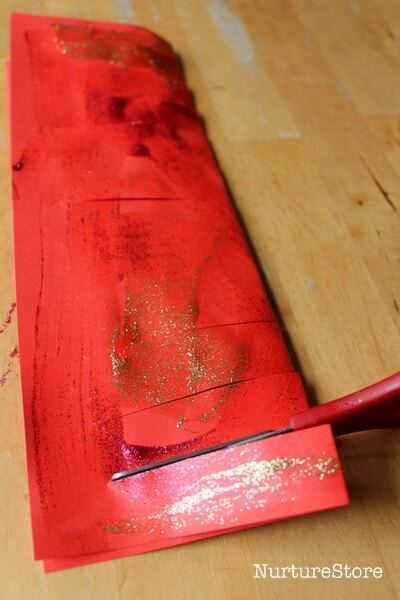 We used gold and red glitter paints.